This Sunday, August 5th, the Princeville Community Association is hosting Music in the Park, a family concert open to everyone. If the weather cooperates there will be craft booths open all afternoon and music from 2:00 on. 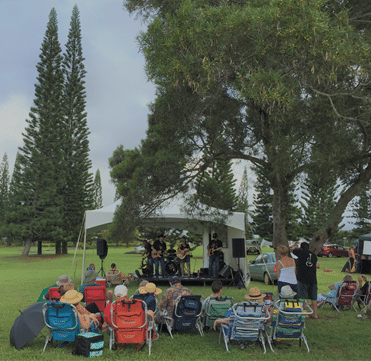 Lots of local talent featuring slack key guitar. Bring the kids and enjoy! Island Grown Aritsan Faire will be held from 1-6pm featuring locally made art- paintings, jewelry, soaps, ceramics, photography, fabric art & wood products. Bring your beach chairs and blankets. There will be food for purchase. ← When Is The Best Time To Visit Kauai, Hawaii?